You’ve been downloading tons of apps, books, music, and movies galore, and when you go to download the latest great app you find yourself unable to, confronted with a “Cannot Download – There is not enough available storage” message. What are you supposed to do when your iPhone, iPad, or iPod runs out of disk space? The simplest and fastest answer is to free up some storage capacity by focusing on apps you no longer use, we’ll show you the fastest way to do this so you can quickly get back to downloading the new apps or content you want. This is by far the quickest way to quickly free up storage in iOS, because virtually everyone has a handful of apps that they no longer use. When you’re satisfied with adequate capacity being made available again, go back to the App Store or iTunes and you’re free to download again. What if I want to use the deleted app again? Is it gone forever? Thanks to iCloud, App Store, and iTunes policies, Apple allows you to re-download owned content and apps as many times as you want to your authorized devices. This means you can delete an app that doesn’t get use now, but download it again at any time for free in the future if you find yourself needing that app again. Whether it’s a few weeks or years later, Apple doesn’t care, once you own the app it is yours, and they’ll store it for you. This generous policy applies to things bought from the Mac App Store as well. If you find yourself frequently running out of storage space on iOS devices, consider following some general tips to free up storage space to further minimize storage usage on iPhones, iPads, and iPods. Things like regularly downloading pictures, streaming music, deleting movies after you’ve finished watching them, all can make a giant difference. Shouldn’t I just upgrade to an iOS device with a larger capacity? This is a matter of choice and opinion, but what we’ve figured out is that you’ll almost always fill up any size device you get regardless of it’s disk capacity, whether it’s 16GB or 64GB. If you find yourself constantly needing disk space, it’s worth considering the upgrade to a larger size at the next release of a product, but generally speaking we always recommend getting the cheaper models, particularly in regards to iPads. Apps Disappearing from iPhone or iPad? Try This Fix! 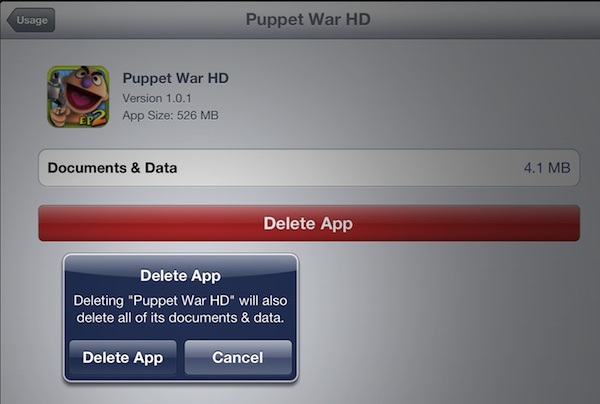 Usually, deleting apps won’t do the job – they don’t want to delete until the synchronizing completes, which won’t complete until the apps are deleted. Delete movies too. Those are big data hogs. With the advent of retina iPad apps, “always” recommending the 16GB version doesn’t seem quite right, anymore. Many people will be fine with 16GB. But most? Whether it’s a few weeks or years later, Apple doesn’t care, once you own the app it is yours, and they’ll store it for you. This generous policy applies to things bought from the Mac App Store as well. Previous purchases may be unavailable if they have been refunded or are no longer on the iTunes Store. Another place to look is within any magazine app. I have The New Yorker app and have been reading issues for many, many months. Until this article I didn’t realize that all the issues which I’ve read have remained on the iPad and was taking space. Went thru the app and “archived” all these back issues. I gained 2GB easily without pain. I don’t know if other magazines do the same, but worth a check. I subscribe to Business Week. And every week there is a new issue. What happens if I archive the issues? Where does an “archived” issue “live”? On my HD or… ? How do I delete old issues? Can I ever access the old issues again if I need to? Is there a way to do this on iOS devices that are running iOS 4 (I have 4.2.1)? I am having problems with my phone and cannot update to iOS 5. I need to find out which apps are taking up the most space and remove them (I literally have hundreds), but have not been able to find a 3rd party program that can help with this. Can I transfer locally stored files to the iCloud to free up space? Doesn’t seem possible but I am out of space due to a TV series that I have yet to watch so would make sense to move it to iCloud? This is a simple fix. Well for some it will be. Just set up your Mac or Windows NAS to share all your Music, Tv, Movies, Pictures, etc. and keep your media off the Iphones and Ipads. Download an app like FileBrowser to access it and boom Bob’s your uncle, no more space issues. With that app you can also download stuff to the devices and copy paste to the Mac or Windows. What about when you’re not at home? Set up the VPN on the Mac or Windows and there ya go! Don’t want to set up a Nas? Ise Itunes Home Sharing Instead. Sure Casey. You download the app FileBrowser from the App Store. It’s about 4 or 5 bucks but worth every cent IMO. After that you log onto your windows based computer (I’m assuming). There’s lots of ways to do this. First is with home sharing. On your iPhone go into Settings, Music, and put in your username and pass. After that download the free app “remote”. Next step is to open iTunes go to settings, you’ll see home sharing. Sign in. Okay so now all your music on your computer is in that remote app, or under iPhone, music, more, shared library. Also makes your iPhone a remote control for iTunes. Volume, etc. Okay the FileBrowser app. On your windows PC, you have to create a Network Share. A simple google search will walk you through that, it’s not hard. Once the share is set, just click “scan” in FileBrowser, it’ll locate it. Do the username and password etc in settings, and that’s it you should be able to copy paste from windows pc, from photo stream, or camera role to the pc or vice versa. Or just stream the music from the pc to the device. No downloading. Okay the VPN, or virtual private network is a neat trick. It makes your computer network available via username, password, and ipaddress. Vpn is buried in iOS until you use it once, then it’s on the main menu. Google where to find it in settings. And google PPTP VPN setup for windows. It’s very easy to set up. Lastly you will need to port forward the VPN through the wireless router. If you need more help just reply ill help you out. VPN makes your network share accessible to the Internet and thus your cellphone via 3G. make sure the VPN username and password are tough. Port 1723 needs to be forwarded on the wireless router for the VPN to work but that should be with the VPN tutorial. It all Sounds daunting but it’s really not. I’m trying to download an app thats 1.36gb, and I have 2.7gb free space. But I cannot download the app because I don’t have enough space? I got plenty of space! Please help! I have this error on my iPad2 but cannot get the error message to go away so that I can delete items. Any idea on how I can get the message off my screen? Thank you!! I only have 9 apps on my phone but I don’t have enough space to download a movie? I have erased over half of my apps and only 1 of the movies downloaded… I’m confused as to how that is possible. Please help? Hey, I have no apps or photos or anything on my iPhone but something is taking up 1.7gb and I need the storage for a new iOS update…I’ve deleted everything but still don’t have space…how do I get this storage back ? You aren’t lying. I deleted everything and still don’t have enough space for a IOS update. truly. My phone says I have 10.5 G of storage used, and below that it lists the apps/photos/whatever is taking space. When I add up the list myself, it only adds up to about 3 Gigs, so where are my 7 gigs!? makes me angry. I have 160 gs of available space through I cloud…. Yet my I phone camera says space is full and won’t let me take anymore photos or videos… How do I fix this? My biggest thing is my FB. I don’t want to lose FB so what do I do? Can I delete it and then download it again? Please help. you can’t hold down the power button on top of the phone to turn it off? the pop up is still there? I have no answers for you, just curious. maybe it will go away after your phone power dies out and the phone turns off that way? How do I remove all these worthless apps ? Like ” stocks , iBooks , FaceTime , podcast , find friends , wallet ,news and health, I have only one app and one video I shot this fall , 10 songs and now only have 644 mb of storage left on my 4s . This will update your iPhone to iOS 8 though, so watch out if you don’t want to do that. So… 1.) WHY aren’t my pics, music, etc. in icloud IF I PAY monthly for way more storage than I need, or if they are there- WHERE? 2.) WHY, after deleting soooo much of my stuff, I don’t have space on my device, and HOW do I do I recover the space from the deleted items without iTunes? and lastly, 3.) if I have both the OneDrive and Google Drive Apps in addition to the Dropbox App, once they are in one or more of them, those, can I delete them from my iOS devices ? What is an app I have on my Apple iPhone 4 called Free Disc about? I thought it was like a “Hard Drive” for your device and able to put photos, Apps, etc inside, thus allowing deletion of them from iOS devices and freeing up space… Can this App Store more apps? Thank you so much for your time and any help.. I need the space badly for our on line business and personal data ASAP …..
I’m very frustrated and confused as I feel I have tried EVERYTHING ! I have no space left now my iPad won’t come on what can I do? My problem is Facebook takes up nearly all my space & no matter how much I try to delete…space amount does not change…how do I restrict usage without deleting the whole app?